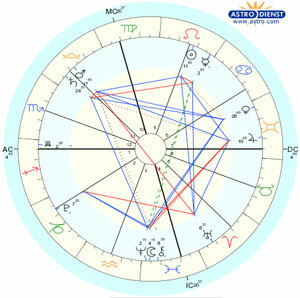 In astrology a chart is a diagram that depicts the positions of the planets at some specific point in time. 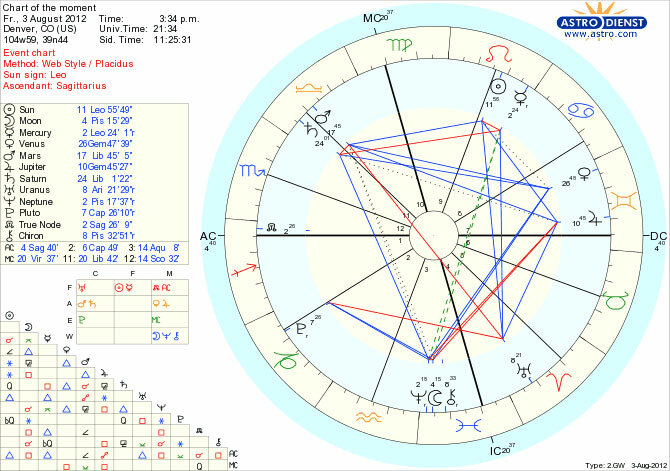 The word “chart” is a shorthand term used to refer to what might otherwise be called an “astrological chart” or “horoscopic chart”. The main component in a chart is usually the planets, although most western charts also depict the signs of the zodiac, the location of the twelve houses, and the relationships between the planets known as aspects. See the image to the right for an example of a typical astrological chart. This chart was generated by the popular online chart generating service www.astro.com. Sometimes the term “horoscope” is used to refer to the chart as a whole, as a synonym, although this usage can sometimes be problematic due to the multiple meanings of the term horoscope.